The first batch of this sauce I made was actually pretty hot. I had seeded and stemmed the jalapeños but I think there were a couple of peppers on the high end of the heat scale because I got a pretty nice kick upon the first taste. The second batch I dialed back the heat. The verde was made to go with the chicken. That is how I like to pair the sauces, green with the poultry and red with the beef. Any combo works but that is how I planned it for this particular meal. I thought a sweet and spicy verde would go perfect with my margarita grilled chicken. Tomatillos look like little green tomatoes in natural paper wrappers. They are actually large berries and are a staple in Mexican cuisine. Preheat oven or grill to 425°. 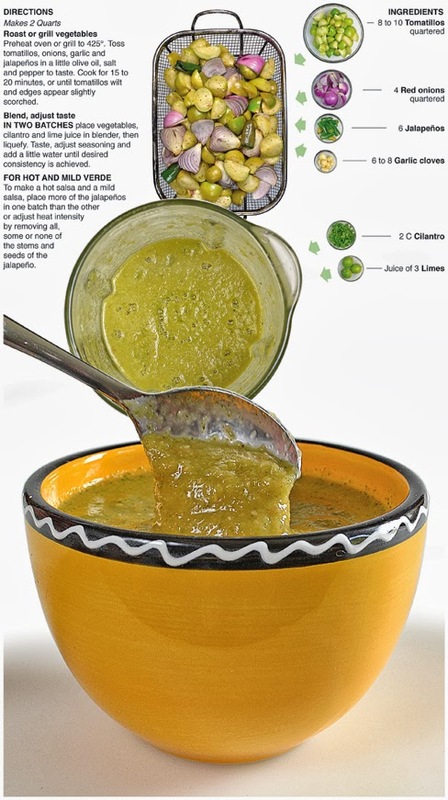 Toss tomatillos, onions, garlic and jalapeños in a little olive oil, salt and pepper to taste. Cook for 15 to 20 minutes, or until tomatillos wilt and edges appear slightly scorched. 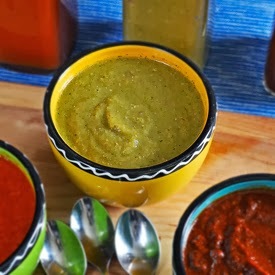 IN TWO BATCHES place vegetables, cilantro and lime juice in blender, then liquefy. Taste, adjust seasoning and add a little water until desired consistency is achieved. 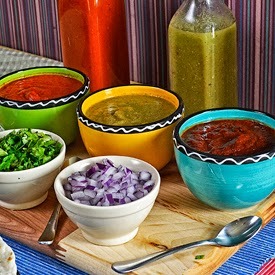 To make a hot salsa and a mild salsa, place more of the jalapeños in one batch than the other or adjust heat intensity by removing all, some or none of the stems and seeds of the jalapeño.